A Sport or an Art form? 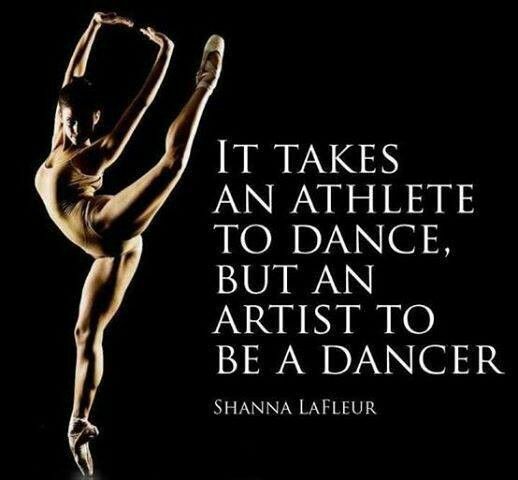 Shanna Lafleur is a professional dancer. She has always had an ambition and passion for dance. This quote is one of her many inspirational quotes about dance and her interpretation. The first time I laid my eyes on this quote I realized there was a whole debate backed up in a single sentence. She was trying to say that dance and sports can be related if we looked in the right context. What is the criteria for something to be considered a sport? “An activity involving physical exertion and skill in which an individual or team competes against another or others for entertainment.” This is the definition of what a sport is according to the Oxford Dictionary. 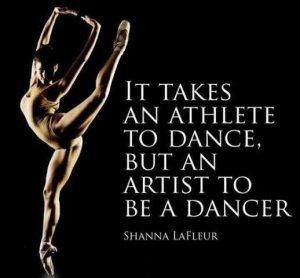 In order for us to come to a conclusion whether dance is a sport or a type of art form we must certainly know what is considered a sport and what is considered an art form. According to the oxford definition dance needs to have physical exertion of some sort, skill, and competition. I think all of these fall under dance. In order to attain a professional level of dancing you need years of training and a lot of stamina. 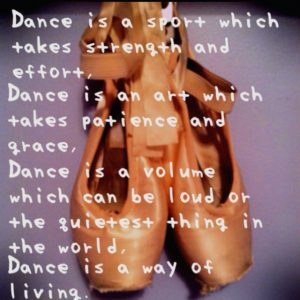 Through the years of perfecting the type of dance you build physical endurance and skill. Dancers do workouts before dancing as a warm up to get their body ready for the vigor of the dance style. When it comes to the topic of competition there’s a bunch of competitions in the dance industry. Some are as famous as the show “So You Think You Can Dance” which is also aired on television for entertainment purposes for the audience.